Could one lens be enough to tempt you? 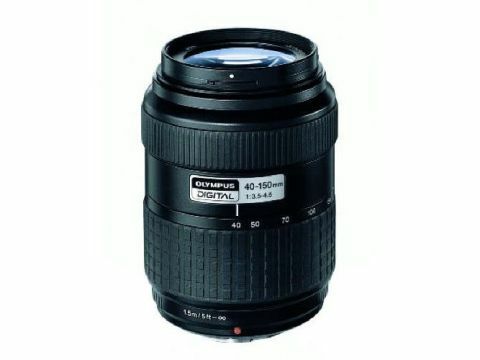 The Zuiko 40-150mm lens is designed for the Olympus E-series cameras, notably the brand new E-500 (reviewed on p34). The Four Thirds sensor in the E-series gives a 2x focal factor, so this lens is an 80-300mm zoom in 35mm speak. Although you can buy it on its own for around £100, this lens is also available in a kit, along with the E-500 body and the 'standard' 14-45mm zoom. These kits are terrific value - we've seen them advertised as low as £630. It's a brilliant lens. Many telephoto zooms are disappointingly soft, prone to chromatic aberration and awkward to operate. This is none of these things. Shots have a contrast and clarity that's extremely unusual at this price. Every shot we took was as crisp as a 'standard' zoom. The E-500's AF system was fast and accurate, even with these long focal lengths - aided no doubt by the lens' wider- than-usual aperture range (f3.5-4.5). The image in the viewfinder is bright and clear, even at the longest focal lengths. Build quality is excellent, even though there's a good deal of plastic. The lens mount is metal and the filter size (58mm) is the same as the E-500's standard zoom.